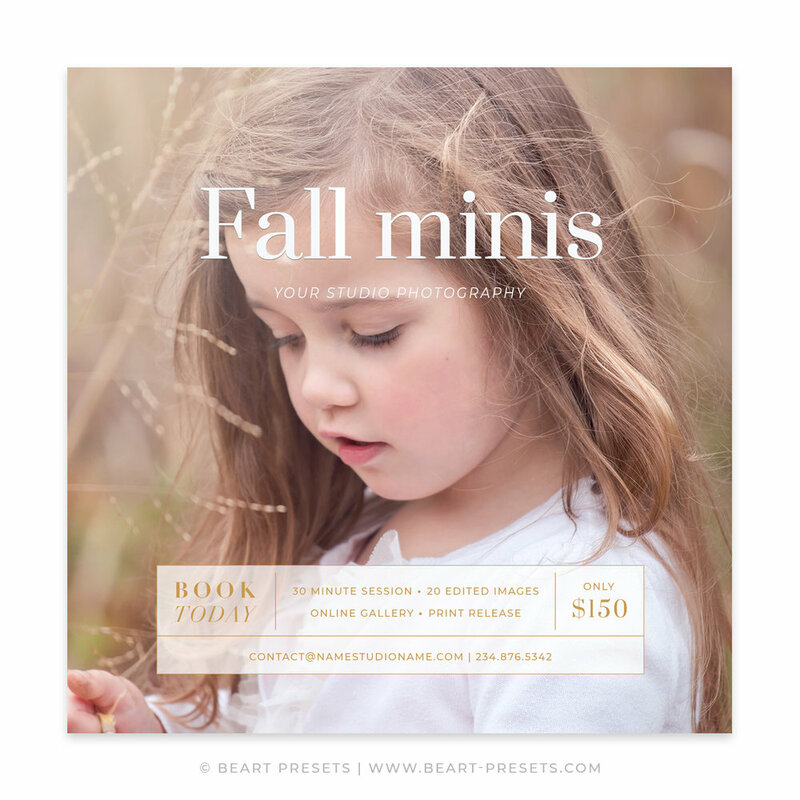 This professionally designed fall mini session template is great for your blog or studio website, email campaigns, or social media sites. Give your clients an incentive to book you again during the holidays or attract new clients to build a long term relationship. Just enter your own images and wording, and you'll be ready to start advertising your Fall Mini Sessions in seconds! Included files: One Layered Photoshop (.PSD) file, 300 dpi. Can be resized for use on social media sites, your blog, website or email campaigns. Easy-to-customize: Fully editable. Easily customize colors and text, adjust opacities. Printing: designed to be printed at home, or at any local or online printing lab. Available for instant download after your payment is processed (download email sent to your PayPal email within 5-15 minutes of placing your order. Please check your Spam folder if you don't see an email). Featured photograph(s) and/or logo(s) are NOT included in the download. Please contact us if you need support or have a question, it’s our pleasure to help!